Oops - we don't appear to have a video for the fi-6110. We bought two of these scanners - one for each office - and they have been extremely good. 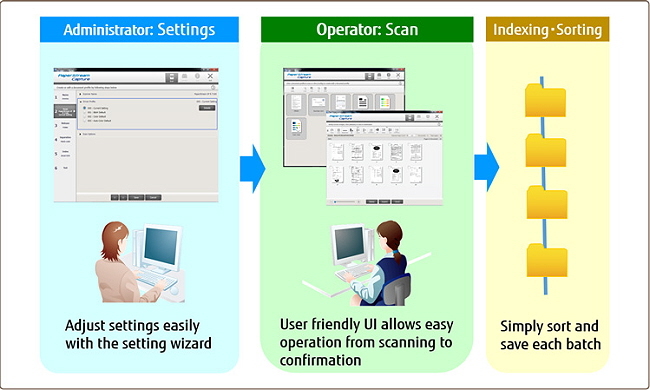 The Scansnap option is particularly good, allowing us to scan to PDF, Excel or Word at the press of a button. The automatic Duplex is also fantastic, omitting any blank pages to ensure that only double sided documents are printed in duplex. Overall the scanners have been fantastic and will be well used when we introduce our new document management software. This is an excellent scanner, we have two of them and they work really well in our offices. 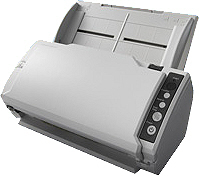 We often scan double sided documents, so the fact that the scanner picks up whether the sheets are double sided and scans them duplex, or one sided and ignores the blank pages saves us a lot of time and hassle. The scansnap software is especially good, allowing us to scan to file/excel or word at the press of a button. We will soon be installing our new document management software, the suppliers of which recommended this scanner, so we will see these machines really showing us what they can do. This is the second Fujitsu scanner that I have purchased from TradeScanners.com. The first one is still going strong after 6 years of daily use and this latest one has fitted into our office without any problems. 5 out of 5. This was the first time I had used a scanner. In the beginning I found it complicated and didn’t know how to put the scanned documents into files but the more I have used it the more I have discovered how to do things i.e. insert scans into a file and now I am very happy with the machine. Excellent Scanner, easy set up and very simple to use. Would buy again. The Fujitsu Fi-6110 introduces professional scanning functionality to the desktop of the knowledge worker in small and mid-sized companies. At the same time, it makes the capturing process faster and easier, preparing the scanned documents perfectly for the subsequent workflow steps. This new document scanner marks an ideal entry choice for small businesses such as solicitors, accountants, constructions companies, medical and automotive companies who are looking for a more efficient and productive way of handling their documents.